Action from Peterborough Sports' (blue) defeat at home to Chasetown last weekend. Photo: James Richardson. There will be no United Counties Premier Division title predictions from Deeping Rangers boss Michael Goode until the new year. Goode is delighted with his team’s progress and there is no denying they are nicely poised for a push for top spot. Key Deeping defender Jonny Clay (right) in action for Deeping. 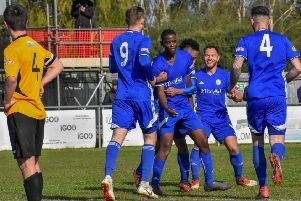 Last weekend’s 1-1 home draw with leaders Leicester Nirvana - the first time Deeping had dropped points at the Haydon Whitham Stadium this season - left Deeping fourth, but just five points behind Nirvana with two games in hand. Captain David Burton-Jones scored the goal. “We are not looking too far ahead,” Goode stated. “We’ve had a solid start, but in the next few weeks we play Newport Pagnell, Eynesbury, Desborough and Holbeach so we will have a better idea of our prospects after that. “It was a good result against Nirvana as we were without striker Scott Mooney and our first-choice full-backs, but we can get better. “We’ve played well at times, but not as well as we would have liked at other times. We have only played eight games at home so far as well. Deeping have an awkward away game at Rothwell Corinthians tomorrow (November 25) which is likely to take place in unsuitable boggy conditions. They then travel to Eynesbury on Tuesday (November 28). Holbeach United missed a great chance to reach the top three on Tuesday when losing 1-0 at Boston Town. That was just a third defeat of the season for the Tigers who are right in the mix along with Wisbech Town. Holbeach have a tough game at home to Daventry tomorrow, when Wisbech should extend their unbeaten run to 15 matches at lowly Sileby and in-form Yaxley travel to ON Chenecks. Peterborough Northern Star will still be under the caretaker-management of Raff Mazzarella for the visit of Wellingborough Town to the Branch Bros Stadium (Chestnut Avenue). Pinchbeck United won their top-of-the-table battle at Raunds last weekend thanks to an Ollie Maltby header. They host fourth-placed Buckingham Town tomorrow. Blackstones host Huntingdon in the first game in charge for new co-managers Daniel French and Lee Clarke. Peterborough Sports aim to arrest a run of six straight defeats in Division One South of the Evo Stik League at Market Drayton tomorrow. Division One South: Belper Town v Spalding Utd, Leek Town v Stamford, Market Drayton Town v Peterborough Sports. Premier Division One: Holbeach United v Daventry Town, Northampton ON Chenecks v Yaxley, Northampton Sileby Rangers v Wisbech Town, Peterborough Northern Star v Wellingborough Town, Rothwell Corinthians v Deeping Rangers. Division One: Blackstones v Huntingdon Town, Pinchbeck United v Buckingham Town, Stewarts & Lloyds v Bourne Town. Division One: Team Bury v March Town United, Wisbech St Mary v Diss Town.